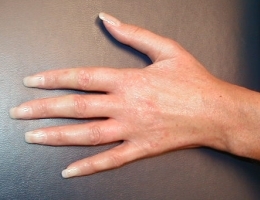 Systemic sclerosis is more common in the United Kingdom than previously reported, a nationwide population-based study determined. Analysis of data from the Clinical Practice Research Datalink, a general practice database that includes approximately 6% of the U.K. population and is considered representative of the entire population, found an estimated overall incidence of 19.4 per million person-years (95% CI 18.3-20.4), according to Fiona A. Pearce, MBBS, and colleagues from Nottingham University reporting online in Clinical Rheumatology. This estimate is more than four times higher than the estimate of four per million found in a study conducted in the 1980s in the West Midlands district of England, Pearce and colleagues noted. The incidence and prevalence of SSc have been reported as having wide variations, with differences according to gender, race, and geography. For instance, women are far more often affected, and individuals of non-European ethnicity also may have a greater risk. In addition, multiple epidemiologic studies have suggested geographic differences, including a north-south gradient in Europe, with lower rates seen in the U.K. and Finland compared with in Greece and France. One systematic review suggested higher prevalence rates for the United States (276 per million) and Australia (233 per million) than for France (158 per million) and the United Kingdom (88 per million). "Understanding the incidence and prevalence of systemic sclerosis will help to address the healthcare needs and aid service planning for this rare disease, both now and in the future," Pearce and colleagues wrote. Accordingly, they identified 1,327 patients in the database diagnosed from 1994 to 2013; a total of 83% were women, and mean age at diagnosis was 58. The 1-year, 5-year, and 10-year survival rates were 94.2%, 80%, and 65.7%, respectively.